Learning to read is a huge milestone for your child, and by the end of Reception / mid Year One, he or she will likely be able to long sentences within a short picture book. There is something amazing about watching your child develop this skill, from when they first begin to read simple words using those early sounds, to when they can read the Gruffalo to their baby sister or brother, all within a year or two. At this point, it might be tempting to think that your job as chief story reader is done. But the truth is that there are so many benefits to you continuing to read to your school aged child on a regular basis. Reading to your child, in particular, reading longer chapter books to your child whilst they are still learning to read themselves, will help them to develop a much broader vocabulary. It’s also a way of introducing a wide range of fiction to your child beyond Biff, Kip, and Chipper, which will help foster a life long love of books for the future. Furthermore, keeping up with a nightly bed time story means that your child still has that special time with you away from any screens or other distractions. However, choosing what to read might be a bit daunting. As much as we all love Julia Donaldson, your child is probably now at the stage where they want to move a bit beyond the picture books that dominated their pre-school childhood. Finding books that bridge that gap between picture books and the likes of Harry Potter can be tricky, so we have hand picked some of our favourites that are loved by 5-8 year olds up and down the country. Spawning three movies and a cartoon series, How to Train Your Dragon is the first of a series of books that features Hiccup Horrendous Haddock the Third, a scrawny Viking boy who happens to be the heir to Stoick the Vast, the chief of the Hairy Hooligan tribe. In the first tale, Hiccup must undertake a rite of passage as he and 12 other Viking boys, almost all of whom are far bigger and stronger than Hiccup, must first capture a young dragon and then attempt to train it. Failure to do so will result in exile from the tribe. The book is funny, charming, and enthralling. Interspersed with pages of text are occasional illustrations as well as “extracts” from a book about dragons that gives facts about the different breeds. If you have already watched the films you might be surprised by the book, given that there are significant differences in both character and plot. The book is a particularly good choice for any child who has ever felt that they are not strong enough, or don’t fit in well with the crowd. You can purchase How to Train Your Dragon here on Amazon with a Kindle edition also available. The audio version is narrated by David Tennant and is delightfully charming. Wickedly delightful and absurd, George’s Marvellous Medicine is a fabulous choice for a first chapter book, particularly as it lacks some of the scarier types of character that inhabit some of Dahl’s other books. Eight-year-old George has a rather grumpy grandmother whom George suspects could possibly be a witch. He decides to make her a new medicine using ingredients sourced around the house, such as engine oil, paint, and shampoo. The medicine has the extraordinary effect of turning everyone who samples it into a giant, but later attempts to recreate the medicine have some alarming results. It goes without saying that great care should be taken to ensure that any child who reads this book is made aware that they should not attempt something similar at home. Furthermore, some parents might be put off by the idea of harming an elderly relative, though it’s worth noting that the topic is approached in a slapstick sort of way. On the other hand, it’s the element of naughtiness that makes it so appealing to children and the reason for its enduring popularity. As with most Roald Dahl books, the accompanying illustrations by Quentin Blake add an additional charming element. You can purchase George’s Marvellous Medicine from Amazon here with audio and Kindle versions also available. 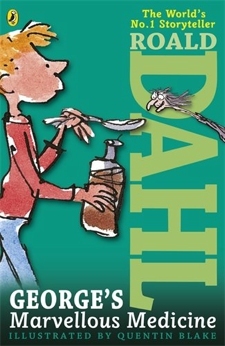 If your child enjoyed this book then do check out some of Dahl’s other classics that are suitable for this age range, such as James and the Giant Peach, and Fantastic Mr Fox. 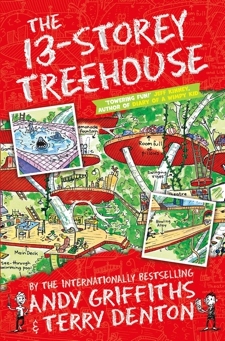 The 13 Storey Treehouse is a brilliantly batty tale about an author, Andy, and illustrator, Terry, who live in a tree house. As the name implies, this is no ordinary tree house. It consists of 13 levels and is equipped with all sorts of weird and wonderful things, such as a man-eating shark tank, a secret underground laboratory, and a marshmallow machine that shoots marshmallows into your mouth. There’s a loose plot of sorts. The boys have a deadline to create their new book and deliver it to their publisher by the next day. However, much of the focus of the tale is on the various rooms in the treehouse and the distractions they cause to the pair, keeping them from their work. If you are looking for a book for your child that has powerful lessons to learn and is full of hidden depth then this is not the book for you. However, if you want something that is laugh out loud funny, and will engage your child then The 13 Storey Treehouse is an excellent choice. The book is filled with comic style illustrations and children will love reading the captions on these whilst you read the text. You can by it online from Amazon here with Kindle and audio versions available. There are several sequels that are equally funny. 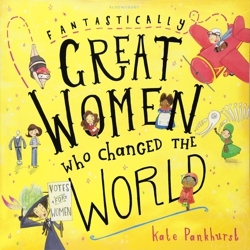 Kate Pankhurst is a descendant of women’s rights campaigner, Emmeline Pankhurst, and she has written this fabulous book, Fantastically Great Women Who Changed the World, that celebrates women who have had a significant impact on the world. This is a non-fiction book, but it’s still packed with adventure. Readers will learn about the explorer, Amelia Earhart, who was the first woman to fly solo across the Atlantic, and Mary Seacole, a British-Jamaican nurse who helped wounded soldiers on the battlefields of the Crimean War, amongst others. Unlike other books on this list this book doesn’t have chapters. Instead, there is a double page about each woman featured, accompanied with eye-catching illustrations. Each page is filled with facts and snippets of information about the women, so you could easily opt to read about one or two women each night, with plenty of opportunity for discussion. Furthermore, although the focus is clearly on women, there’s no reason why your son wouldn’t enjoy this book, as it’s brimming with history, science, and adventure. You can buy the book online from Amazon here. Enid Blyton is one of the world’s most successful story tellers, having written over 600 books and sold over 500 million copies worldwide. She is probably best known for her Famous Five series, but for younger children The Magic Faraway Tree series of books is a good choice to start with. 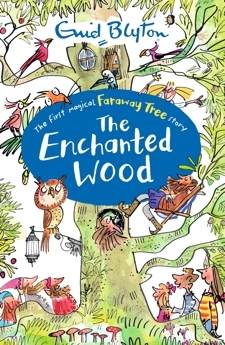 The first book in the series is The Enchanted Wood. It is here that we meet three children, Joe, Beth, and Frannie, who have recently moved to a new house near a wood. They venture into the woodland one day and discover an astonishing tree that is home to an entire community of magical creatures. At the very top of the tree, there is a ladder that leads to a different land each time they visit. The book, and subsequent books in the series tell of the children’s adventures in the lands they find there. Of course, Blyton’s work isn’t without controversy, with attitudes towards race far different during the time she wrote her tales than they are now. Which is why many of her books, including The Enchanted Wood, have been amended in recent years to remove inappropriate references and names. This version, available on Amazon is one that has been updated accordingly. Long before Voldemort was defeated by an infant Harry Potter, the magical world was inhabited by Mildred Hubble, a young witch in training who attended Miss Cackle’s Academy for Witches. 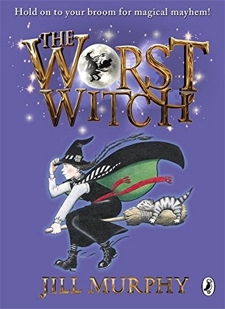 The Worst Witch was published in 1974 and since then there have been an additional seven books in the series, the most recent of which was published last year. In addition, there have been several TV adaptations, including one that aired on Netflix in 2017. The story features Mildred Hubble, who despite her best efforts, is considered the worst pupil in the school, thanks to her various mistakes in spell craft that often have disastrous consequences. The book is another great choice for children who perhaps struggle to fit in school or who are struggling with self-esteem when comparing their achievements to those of their peers. Unlike Harry Potter, who is the chosen one, or his friend Hermione, who was exceptionally bright, Mildred is really rather ordinary, making plenty of mistakes on the way, and that is what makes this book so appealing. What’s more, unlike in Harry Potter, the series of books remains fairly light-hearted throughout, making it more suitable for children in Key Stage 1. It’s available to buy online at Amazon here. Naughty characters are a staple of children’s literature, from the adventurous, but rather selfish Peter Pan, to the mischief making Dennis the Menace from the Beano comics. Naughty characters appeal to children, even the most well behaved, since they act out the mayhem that almost all children harbour a secret desire to do themselves. Horrid Henry takes naughtiness to a whole new level. Even his mother thinks his nickname is apt. This is the first book in a series of 25 books that have also spawned joke books, activity books, cartoons, a film, and video games. Henry teases his younger brother, Perfect Peter, mercilessly, and spends his days generally being as disruptive as possible. This first book is made up of four short stories. 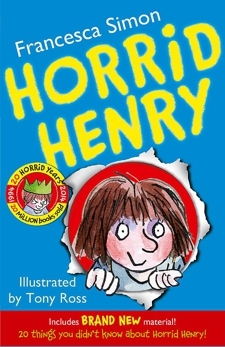 In the first story, it is rather telling of just how naughty Henry can be that he spends the day attempting to emulate his perfect brother Peter, and in doing so he disturbs his parents who believe that there must be something very wrong with Henry that is causing him to be so well behaved. Horrid Henry will undoubtedly delight children who revel in cheekiness, but it is worth bearing in mind that some parents have criticised the book for inspiring their own children to become mischief makers themselves. It’s available to buy online at Amazon here. The Lion, the Witch, and the Wardrobe was first published in 1950 and it has been loved by generations of children ever since. The book has strong Christian themes, being an allegory of the death and resurrection of Jesus Christ. However, non-believers shouldn’t be put off the book for this reason, as the theme would go over the heads of most children and it is, essentially, a fantastical tale of good versus evil. In this book, we meet four children, Peter, Susan, Edmund, and Lucy, who accidentally discover an entire magical realm that is accessed through the back of an old wardrobe. Once in Narnia, they meet a plethora of magical creatures, such as fauns, talking animals, a wicked witch, and even Father Christmas. It’s a book that will inspire the imagination, but it’s worth noting that there are scary moments at times and it may not be suitable for more sensitive children. 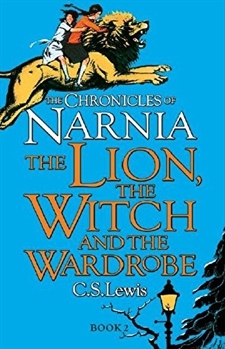 Fans of The Chronicles of Narnia will be well aware that although Lewis wrote this book first, in terms of the suggested reading order The Lion, the Witch, and the Wardrobe actually comes second after The Magician’s Nephew. However, as the later books in the series do become a little darker, you may want to consider reading The Lion, the Witch, and the Wardrobe as a standalone book to begin with, and save some of the others for when your child is a slightly older. You can buy it online from Amazon here. We couldn’t create this list without a nod to Beast Quest. 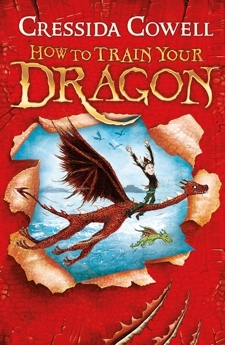 Over 100 books have been written in this series that tells of the adventures of Tom and Elenna in the magical realm of Avantia and the books are particularly popular with boys who may have otherwise been reluctant readers. That being said, plenty of girls also enjoy the adventures that the books have to offer and Elenna is a strong female character who supports Tom in his heroic endeavours. Adam Blade is a pseudonym for a team of writers that create the books, and it’s fair to say that they are formulaic and somewhat predictable. However, they do make for a thrilling read for young readers, and they are written in a way that makes them accessible for young independent readers. As a result, these are a good choice if you are looking for a book that you can read to your child and your child can read for themselves. The books are numbered and there are multiple series, with each series having its own name. 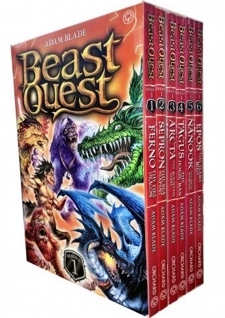 The reading order becomes less important later on in the series, but in the first six books that form the first series entitled Beast Quest we are first introduced to Tom and given his back story. Tom is the son of a great warrior who has gone missing, and Tom is given an important task by the King. He travels through the land of Avantia, which has echoes of other fantasy lands, such as Narnia and Mordor. He meets Elenna and together the pair attempt to rescue the land of Avantia from the evil forces that are creating havoc and danger for the people who live there. You can buy the first series as a set from Amazon here.